Gaga greetings from Gotham! A day after landing in New York City for the Thanksgiving holidays, we dropped by Barney’s on Madison Avenue which was in a frenzy for the official unveiling of “Gaga’s Workshop”… Lady Gaga herself, cut the ribbon to the special area on the 5th floor of the store and some of the profits from the sale of special items will be donated to a charity of her choice. We were browsing with the Teen, and debated waiting around to catch a glimpse of Lady Gaga, but decided to just come back later tonight or tomorrow to see what all the fuss is about. The special streetside display windows will be unveiled for the holidays soon, and Barneys on Madison Avenue will be open to the public starting at 11:59pm Monday night. More on the opening, here and here. I knew it! I guessed that you will be going to the east coast for Thanksgiving when you mentioned a couple of posts back that you will be travelling for a day. Have fun and enjoy! Such a small world indeed. I too am amazed at how bizarre some connections can be. you’re truly global, MM! wow, in time for the parade! sister must be cooking up a storm now…waiting to see what sister has in store for the feast! have fun, MM and family! I enjoy Lady Gaga’s music – it’s great to listen to while driving long distances, not to mention some of her songs are great for dancing (aerobic dancing, that is). It would be great to see her doing her workshop at Barney’s. She always surprises with her outlandish outfits – that alone is worth the queueing and ogling. Have a wonderful Thanksgiving celebration with Sister and family! Ok I know you’re busy. If the kid likes Justin Beiber he will be at the rockefeller center Today show tomorrow morning and thankgiving parade. It’s a small world after all :) It was nice bumping into you & your family. Looking forward to your next food adventure! Happy Thanksgiving!! Would love it if a photo of Lady gaga would appear on MM. Hahaha. And i hope to bump into you someday too! Welcome back, MM! I hope I bump into you. I’m a big fan! yey! would love to see what lady gaga’s up to over at barney’s. just read another popular pinoy blogger bryanboy blogging about it too! Oh how I wish I could spend thanksgiving in the States again….which is better for you, roasted or fried turkey? Hi MM, I would love to have a peek at sister’s Thanksgiving spread this year. I am sure it will be another fabulous table. Happy gobble-gobble! Degree of separation? 2? Wow! 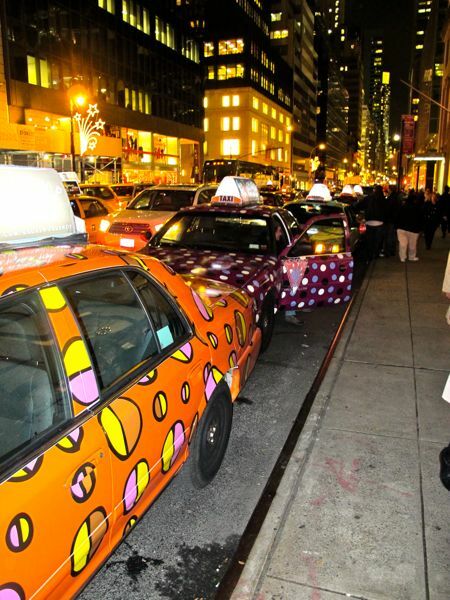 Love the colours on those taxi’s! Im a lady gaga fan. Did you watch her show A Gaga Thanksgiving during thanksgiving evening? She is just so eccentric, but full of talent and passion. Have a nice Thanksgiving to you MM and family.